There’s been talk of Independence Day 2 damn near since the first one was released in 1996 and became a massive hit. After tons of false starts, rumored script battles, and casting troubles, it appears that things are finally moving forward. There’s even a June 24, 2016 release date scheduled that will get the movie into theaters just in time for the Fourth of July weekend they ruled 20 years before. Producer Dean Devlin has been discussing the project, and recently shared some information about why they’re only shooting one movie this time out, what the star and script situations looks like, and even touched on the Stargate reboot with director Roland Emmerich. We decided just to do one first to make sure that people like where we’re going. If that works well, there’s an ability to do some world building, which would be really fun and interesting to do. I think Roland and everybody felt, let’s just make sure 20 years later that people still are interested. I think in our case, we started to feel that maybe we were being a little bit arrogant by assuming that we could do two movies. We said you know what, let’s scale it down. Let’s first make sure that it works for everyone. I’m not sure of the reasons why Will ultimately decided not to do it. You’d have to ask him. I think he was just at a place where he did seriously consider it. We had a lot of meetings with him, but at the end of the day he decided that doing this wasn’t right for him. There have been reports of two versions of the script, one written with Smith in the starring role, and another to be used in the event that he passed. Devlin said, “He [Emmerich] developed a new script with a couple young writers and the new script is fantastic. We’re very excited about shooting.” Given the progress and the timeline, we should start hearing news about casting and production before too awful long. I’m sorry but Kurt Russell is completely replaceable. Spader did a nice job in that movie but I think he replaceable as well. :O Kurt Russell is a legend! 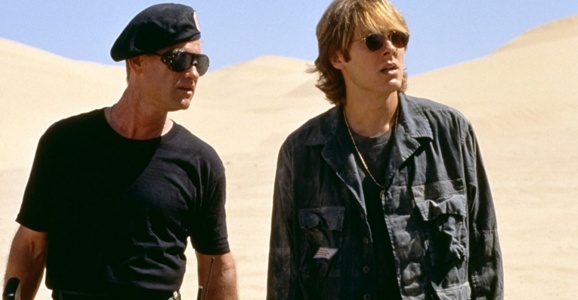 Kurt was OK, but I still prefer Richard Dean Anderson’s Jack O’Neill from the TV series. That being said, I fail to see why we need a reboot of the movie and/or series. If they want to reMAKE them, then great, but rebooting it and possibly going another direction (ala the Star Trek reboots) would not be something I would be interested in seeing. Come on, the series lasted 12 seasons, how many other shows can say the same? Sure, they had to come up with new villains from time to time, how many times could they fight the Goa’uld without things getting stale, but the series is still one of the most iconic (IMO) sci-fi shows around. Now if they wanted to reboot Stargate: Universe, I wouldn’t mind, never was a fan of that show since it was basically just Battlestar Galactica’s reboot in disguise, again IMO. Stargate SG-1 lasted for 10 seasons. SG-1 was 10 seasons, but SG television in full lasted 17 years. For crying out loud what kind of movie making team puts Independence Day ahead of Stargate?